The global semiconductor industry uses highly complex processes to manufacture state of the art integrated circuits and microelectromechanical systems for a wide variety of applications. Nowadays, these applications go well beyond the traditional information processing and storage. The measurement of the material and device level properties of a semiconductor is essential knowledge to any practicing engineer and researcher. Due to the dynamic nature of this industry, a large body of measurement techniques had been developed over the past five decades. There are excellent texts such as D.K. Schroder’s textbook on the characterization field. However, these texts do not cover the increasingly important topic of strain measurement in semiconductors to any sufficient extent. This eBook is the first attempt to fill this gap in the literature. It is a bridge between the review articles in journals and full length research monographs on one specific topic. The author has made a comprehensive survey of the available strain measurement techniques which are grouped according to the type of electromagnetic radiation or particle beam used to probe the sample. The chapters of this volume follow a uniform structure. For each technique, the essential theory is outlined first with reference to the published literature. This is followed by the experimental method and the capabilities and limitation of the method. Examples of how the method is applied in practice are then given. This format and the conciseness of each chapter will make it convenient to refer and it is not necessary to read the chapters in sequence. This eBook should be a useful addition to the semiconductor literature and its electronic format will ensure it can remain up to date in future. 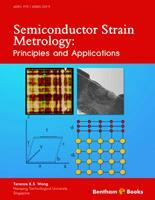 The idea of writing this eBook on semiconductor strain metrology occurred to me as a result of supervising a doctoral thesis on strained silicon devices. During the summer of 2005, colleagues from the semiconductor foundry industry expressed to me the need for a simple, in-line measurement technique for the strained silicon devices which were beginning to be introduced into mass production at that time. The quantity to be measured, strain was until then something that is quite extraneous to the device community. As a result, there was no existing technique and equipment that a microelectronics engineer could use to obtain accurate strain data within a silicon field effect transistor. There were of course strain measurement techniques available then but these were developed for bulk materials by mechanical engineers. Hence, they are quite ill suited to the needs of a device engineer which is to find out how strain is distributed within small regions of nanoscale devices. Especially important is how strain is changed by the processing conditions imposed during fabrication. New strain characterization techniques with nanoscale spatial resolution, precision and reproducibility are needed. These must furthermore be compatible with the cleanroom environments of semiconductor manufacturing. They should be in-line and preferably be non-destructive. Over the course of the next two years, we developed a strain measurement technique that can be called an extension of a standard technique that is used in every semiconductor cleanroom to measure film thickness. The technique is spectroscopic ellipsometry and it was chosen because it requires no new hardware to be procured. Building on the research done on strain effects in semiconductors during the 1970s, we were able to use the strain effect on the variable angle ellipsometric spectra of silicon to deduce the strain in a biaxial strained silicon layer and also obtain agreement with strain deduced by other characterization methods from the same sample. By the time the journal paper for this research was published in Semiconductor Science and Technology in 2007, it was apparent to me that various strain measurement techniques had been developed over the years by researchers from the materials engineering, mechanical engineering and synchrotron radiation communities. Some of these techniques have high spatial resolution and will be of increasing importance in the future. This is because strain effects are also key to the device physics and reliability of nanoelectronic devices such as nanowire transistors, nanophotonic devices and microelectromechanical systems. The literature on these newer strain measurement techniques is very scattered and some of the journals and conference proceedings are not well known to those outside their respective research communities. For this reason, it should be useful to have an up to date (and readily updatable) volume on contemporary strain measurement techniques for the practicing engineer and researchers from different disciplines. The goal of this eBook is to communicate in a concise but quantitative manner the principles and applications of the many different semiconductor strain measurement techniques available. I thank Bentham Science Publishers for making me aware of this new format of publishing which is especially suitable for the topic of this volume. I would also like to thank the technical staff of the former Chartered semiconductor manufacturing Ltd. for introducing me to this interesting field. Finally, gratitude is expressed to Dr. Grahame C. Rosolen for proof reading several chapters of this volume during the manuscript revision.